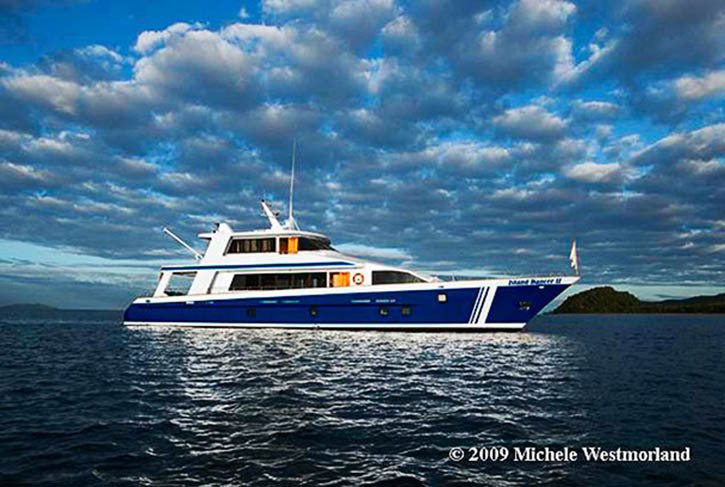 Climb aboard the intimate, 10-passenger Island Dancer II for a live-aboard diving adventure to paradise. Guests will depart Suva to explore the colorful reefs, bommies and walls of Nigali Pass, Wakaya, Koro and Namenalala Islands. Drift dives with eagle rays, mantas, turtles, sharks and giant groupers are also on the itinerary. To top off the exiting diving and experience some of Fiji’s local culture, a visit to a Fijian village on one of the remote islands is arranged including a Kava ceremony and warrior dance. The Island Dancer II appeals to those discriminating divers who prefer a smaller group and is perfectly suited for Fiji and the diving itinerary. All indoor areas are air-conditioned and each of the guest cabins feature ensuite facilities. The beautifully appointed salon has ample room for divers to view their photos and videos or to enjoy a movie on the entertainment system. The sundeck features covered and uncovered lounging and is a perfect place to relax with a book during surface intervals. Owners Suite (#1) Queen Bed, Private Facilities, Picture Window View, Mirrored Cabinet, Wardrobe, Bathrobes, Hairdryer, Toiletries, Fresh Towels Daily. Deluxe Stateroom (#2, 3,4,5) Double Bed (lower) and Twin Bed (upper) bunks, Private Facilities, Mirrored Cabinet, Wardrobe, Bathrobes, Hairdryer, Toiletries, Fresh Towels Daily. Diving from Island Dancer II is easy – it is a mix & match of diving from the sea level dive platform that runs the width of the transom of the Island Dancer II, of sometimes a short tender ride (5 mins max) to the dive site w/ a drift back to Island Dancer II for your safety stop & easy re-boarding by the large dive deck ladder and occasionally, from the dive platform on Island Dancer II w/ pick up by tender for return to Island Dancer II – this is all dependent on tidal (current) conditions at each different dive site. Jim's Alley consists of 3 large bommies that start at about 15 feet from the surface and drop to the floor at about 60 to 70 feet. The bommies are covered in soft and hard corals, sea fans, whips and anemones. This sight also frequently has white tips, turtles, barracudas and an occasional ray. Ningali Pass is a small cut in the reef that can only be dove 1 1/2 hours before low water to 1 1/2 hours after low water, otherwise the visibility is poor and the current can exceed 4 knots. At this sight we see large grouper/jew fish, barracuda, big eyed jacks, snapper, big gray reef sharks and an occasional sea snake. We also have seen eagle rays, mantas and hammerhead sharks. Coral Gardens is a series of bommies that have a beautiful supply of hard and soft corals. This sight also has turtles, white tips sharks, moray eels, lion fish and once in a while a nurse shark. Visibility can sometimes be below 40 feet because of heavy plankton. "Hi-8" for the amount of video footage taken. Both E-6 and Hi-8 are pinnacles that start at a depth of 3,000 feet and rise to the surface. E-6 has a horseshoe shaped grotto which is filled with anemones, large clams, lionfish and spectacular red sea fans and soft corals. Each has a virtual smorgasbord of soft corals, hard corals, sea fans, sea anemones, octicoral, swim-throughs and are teeming with smaller fishes of the South Pacific. Included at both sights are sweet lips, hammer heads, white tips, occasional silver tips and if we're lucky a whale. Golden Rock is a bommie that starts at 35 ft. on the high inside edge it then comes up to 10 ft. and is 20 ft. across. This site has soft coral, hard coral, cleaner shrimp, blue ribbon eels, lionfish, and most important it is a cleaning station for mantas and we see mantas here 90% of the time. Sand Point is a wall dive between the island of Wakaya and Mokongi. On this dive we frequently see mantas, eagles rays, turtles, white tips and the various colorful fish of the South Pacific in abundance along with hard and soft corals. Wakaya Pass starts at about 35 ft. sandy bottom then you swim out over a wall and turn to the left. As you come over the drop off of the wall you can look straight down to about 140 ft. While swimming along the wall you may see blue ribbon eels, White tip, Nurse, and Hammerhead sharks along with Mantas, Marble Rays, Turtles, Eagle rays and Barracudas.